The current international situation has unfortunately generated a climate that curbs and disrupts attendance at international conferences. Also, the attendance at international conferences has become extremely expensive due to the rising costs involved in international travel, accommodation, conference fees and other expenses. This, in turn, impedes discussion and interaction between international academics and contributes to the retardation of knowledge expansion and exchange. However, the need to publish remains: not just for the recognition of individual and institutional work, but more importantly for the exchange of ideas and the advancement of engineering and technology education globally. The progress of knowledge for all humankind should not be confined to borders, or indeed regions, and it is certainly not bound by particular modes of dissemination. The objective of the WTE&TE is to remedy this situation by providing potential contributors with the opportunity to publish their articles by offsetting the publication costs with a modest publication fee. 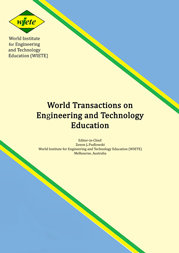 The journal will include fully peer refereed, high quality original articles, which cover a wide range of issues, topics, ideas, problems and challenges that are faced by academics involved in engineering and technology education. Articles dealing with cross-disciplinary matters to promote and encourage interdisciplinary research, development and collaboration are particularly welcome. It is the ambition of the publisher and its partner institutions to enhance the dialogue and interaction between academics in developed and developing countries. Therefore, the publication of the journal was resumed as an open access publication in electronic form. The WTE&TE is fully available through the Internet. Each annual volume consists of 3-4 issues, depending on the number of publishable articles submitted.